Born and raised in St. Landry Parish, Louisiana, Hadley J. Castille learned to play the fiddle as a young teen from his Uncle Cyprien Castille. An accomplished player, Uncle Cyprien instilled into Hadley a deep appreciation for the Cajun method of making the fiddle sing. Castille grew and developed his music into a unique blend of old and new, including many original songs written by him and his son, Blake. His song, “200 Lines: I Must Not Speak French”, an autobiographical account of being punished for speaking French on the school grounds, was the winner of the Cajun French Music Association’s “Le Cajun” award. 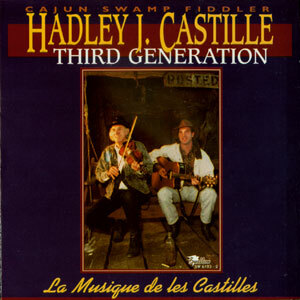 Keeping Cajun music alive and attractive for the younger generation was important to Hadley, consequently his brand of music delivers all of the tradition of yesterday with a contemporary touch. Hadley was the consummate entertainer interspersing lively anecdotes and stories about the Cajun people and culture in between songs during his performances. Mr. Castille passed away in 2012. 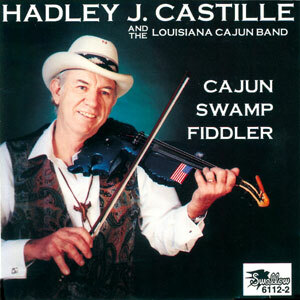 Renowned Cajun fiddler, songwriter, vocalist and performer Hadley J. Castille is a living legend. He is also one of the most incredible exponents of the southern Louisiana musical genre, and he has influenced scores of Cajun artists who have followed in his path. His latest CD, “Refait” on the Swallow records label is a retrospective recording, which features 20 of his most popular songs, digitally re-recorded with his Sharecroppers band. The CD is one helluva musical pleasure for Cajun music fans. Castille is a storyteller and a lively interpreter of Cajun history and tradition. He brings you into the music with his warm and inviting voice and his mastery of the fiddle. Among the most pleasing tracks featured on “Refait” are: “Cyprien and Marie;” “Charivari;” “Diggy Liggy Lo;” “Ponique and Lodi;” and “Who Cut the Vine.” Most of the material featured on “Refait” is about relationships, family, making moonshine, and life in southern Louisiana during various periods in history. All of these images conjured up musically through the eyes of a seasoned veteran songwriter and storyteller whose been perfecting his craft for the past 60 years. Featured musicians on this CD include Hadley J. Castille (fiddle and vocals), J. Blake Castille (acoustic and electric guitars), Rick Lagneaux (piano and background vocals), Kenny Alleman (drums), and Rick Benoit (bass guitar). “Refait” earns a four-pepper rating. Hadley J. Castille started playing fiddle at age 10. A few years later, when Harry Choates’ historical version of “Jolie Blonde” came out in 1946, Hadley became much influenced by Harry’s Cajun Swing-style. Hadley J. Castille built up a successful career since then. 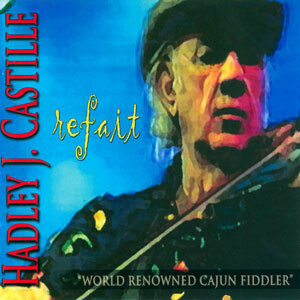 “Refait” is Hadley’s 5th CD. It’s a retrospective recording, featuring 20 of his most popular songs, digitally re-recorded with his Sharecroppers band. This record includes some Cajun classics, like “Diggy Liggy Lo,” “Big Texas” (the earlier version of Hank Williams’ Jambalaya), “La Cravate,” and originals made by himself. His own songs are autobiographical. “Cyprien and Marie,” is a bluesy song about his uncle and the wife who left him. “200 Lines” is a lament about his struggle as a schoolboy being punished for speaking French. “Charivari” includes a very fine cheerful fiddle tune and is about his mother first marriage. “Faire Whiskey” is a typical South-West Louisiana country-swing song about… guess what! In “Old Sharecropper’s House,” a Swamp Pop ballad, Hadley visits his old home to find out everything has changed; while in “Hadley’s Dream,” a real fine Cajun Swing tune, he meets a beautiful angel. This is a fine CD of French Louisiana Country. Today, 72 year old Hadley still performs 1 to 3 times a week and already plans to record another album soon.